ACR Commercial Roofing offers residential & commercial roofing services in Texas. We are rooted in a proud record of 20+ years of roofing expertise! If you can afford it, a metal roof is just about as good as it gets in terms of long-lasting roofing systems. Plus, they look sharp on all kinds of buildings. While a metal roof is said to last nearly a lifetime, you still need to maintain it as the years go by. After all, it’s important to take care of such a valuable asset. ACR Commercial Roofing provides metal roof coatings to clients in Lubbock, TX. To get a free onsite roof evaluation, give our team a call at (806) 669-7777. With over two decades of commercial roofing experience, the team members at ACR Commercial Roofing are ready to help provide more clients with fantastic end results. Our roofing technicians are properly insured and licensed. When you hire a top company like ACR Commercial Roofing, you’ll be rewarded with a longer-lasting roof. To get more out of your metal roof, you should schedule a couple of roof inspections per year. 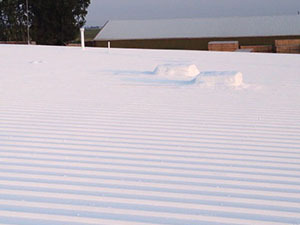 This will help ACR Commercial Roofing prevent your roof from developing any major problems. Our roof inspections will help keep your metal roof repairs small and save you money on your roof. ACR Commercial Roofing can add several years extra to your metal roof by installing a metal roof coating. This quick and affordable service is an extremely cost-effective solution. The seamless layer will keep your roof fully watertight. With a new roof coating, your metal roof will be even more reflective. This can mean a significant amount of savings on energy costs. A roof coating is very lightweight as well, so you won’t be increasing the weight of your roof. There is no more qualified company around to install a new roof coating than ACR Commercial Roofing! ACR Commercial Roofing offers metal roof coatings at competitive prices to the people of Lubbock, TX. You can count on us to handle roof inspections, roof repairs, roof replacements and much more. Give the team at ACR Commercial Roofing a call at (806) 669-7777. We can schedule a day for us to swing by and evaluate your roof for free. Contact us for efficient, professional service you can trust! ACR Commercial Roofing proudly serves Pampa, Amarillo, Plainview, Wichita Falls, Dallas-Fort Worth Metroplex, Lubbock, Midland, Abilene, Odessa, El Paso, San Angelo, Guymon (OK), Woodward (OK), Beaver (OK), Boise City (OK), Tucumcari (NM), Clovis (NM), Carlsbad (NM), Las Cruces (NM), Roswell (NM), and the surrounding areas. Lubbock Location 330 E. 40th St. Copyright © 2019 ACR Commercial Roofing. All rights reserved. Designed by Top Roof Marketing.